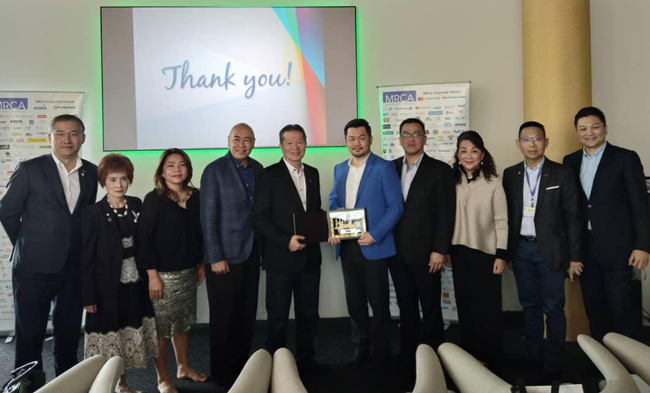 Chua (fourth left) and key council members of the MRCA presenting Wong (fifth left) with a token of appreciation during a MRCA membership recruitment session with local retailers hosted at Regal Lands’ sales gallery. KUCHING: Malaysia’s retail sector is set to gain on the growth in tourism, says Malaysia Retail Chain Association (MRCA) president, Datuk Sri Garry Chua. “Retail is a fast growing and strong sector, and it is probably about 10 per cent of the GDP today, excluding wholesale. Besides just being an important part of our economy, it also plays a very important element in the tourism sector,” said Chua during an exclusive interview with The Borneo Post. He explained that an increase in tourism would naturally boost sales in the retail market, so the two industries would need to grow together in order to meet the demand of the market and its consumers. In Kuching, Chua noted that the local retail market has not caught up to the rest of Malaysia yet and attributed the slower growth to our limited and spread-out population in our large state. “Because of this, you cannot expect so much from the local retail market. This is exactly why tourism is especially important in Sarawak. “If you look at Sabah, it is so vibrant now due to the increasing number of tourists and this is something that Sarawak can achieve as well,” he said. To help kickstart the local retail market into higher growth, Chua advocated for the state to seriously look into boosting tourism through increased direct connectivity to the rest of the world. “Connectivity is very important, and I think the Sarawak state government needs to actively engage with airlines like AirAsia, Malindo, Malaysia Airlines and other international airlines to increase direct connectivity to other terminals in the world. “When you have direct flights here, then the tourism sector will start boom. Kuching is such a fantastic city, full of heritage, nature, good food and a friendly and accepting diverse populace. Here, people don’t about race and religion, it is so peaceful and is a prime example of what Malaysia should be. “With all this potential, I believe Kuching will follow suit in the tremendous growth seen in Sabah once it has established more connectivity to the rest of the world,” he declared. Tourists from China are expected to be a huge boost to the local economy especially as Chua guides that they are the biggest spenders in the world. Last year alone, the 120 to 130 million tourists outbound from China had spent a whopping $US260 billion. “Whether you like it or not, the whole world is current enticing and courting Chinese tourists because they are big spenders and have the power to help revive a sluggish retail market. “For example, Italy had a million Chinese tourists last year and they helped wipe out luxury goods that were slow moving. Japan as well, a few years ago, their stores were stagnant but today, they cannot stock inventory fast enough because the Chinese are big and generous spenders. “If Malaysia is able to tap into this, you will see our retail market go very fast because the effect of tourism is immediate. Today you attract them, tomorrow they will fly over and start spending money. “With many tourists in Kuching, a lot of money will be circulating so it is good for economy and good for all the people here. The state will thrive and prosper,” he said. Just focusing on the growth of tourism sector will not be sufficient in the long run as players in the retail market are also obligated to cater to the various needs of our visiting consumers, Chua said. “Playing in with the government’s desire to attract more tourists, we (retail players) also play a major role in making Malaysia into a shopping paradise that will keep tourists coming back for more. Agreeing with this sentiment, Nicholas Wong who is the executive director of developer Regal Group, guided that the group would be striving to be a key retail player in Kuching by deviating from traditional retail standards. “As a property developer, Regal Group does not stop at just building brick and mortar and selling square feet. He added that the MRCA’s presence in Sarawak would help Regal Land’s and other local retail players achieve this goal. “We can foresee the potential and enhancement that MRCA can bring to Sarawak’s retail industry. Introducing MRCA to the Sarawak’s market, we are essentially building a platform that brings together synergies to create more sustainable values for our local retailers and consumers.” Currently, the MRCA’s has a 6-point action plan that aims to establish a MRCA chapter in all the major cities across Malaysia – Klang, Johor Bahru, Penang, Kuching and Kota Kinabalu. After founding itself in Klang, the MRCA moved their sights onto Johor Bahru and Penang in the last two years and is currently aiming to open their third chapter in Kuching. “The plan is to make Kuching a chapter to represent Sarawak, and to enhance and development the local retail and franchising sector to match what is seen in KL today,” said Chua. Urging local retailers to join the MRCA and help establish the Kuching Chapter, Chua guided that membership in the MRCA would be mutually beneficial experience for all members. With their members behind more than 450 leading retail or franchise chain stores, the MRCA would act as a platform that allows its members to easily collaborate, implement joint marketing activities or share resources. In addition, the association would also provide education, marketing and networking opportunities to their members. For education, Chua guides that this will come in the form of monthly meetings to share the latest development in the retail sector and training, seminar and education programmes on branding, operation and financial aspects.